Unwilling to venerate the statue of Zeno (namely Zeus). 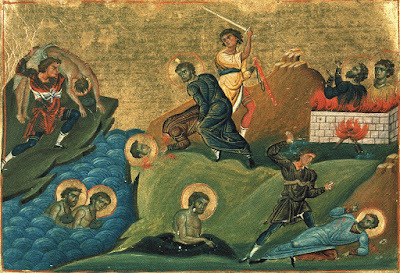 After the Emperor Maximian had 20,000 Christians burned alive in a church in Nicomedia a few days after the celebration of the Nativity of the Lord, he thought he had killed what was left of the Christians of the city. For this reason he called for a public festival to the goddess Demeter, and at this festival a large altar was set up for sacrifices to be offered. Now there was a pious Christian in the crowd named Zeno, who filled with divine zeal stood in the midst of the multitude and addressed the emperor, saying: "You are deceived and led astray, O emperor, in giving veneration to insensate stones and deaf wood. The demons have tricked those who worship such objects and led them to destruction. Cease, O Maximian, being so mindless and foolish. Come to your senses; instead, raise to the heavens both the eyes of your body and mind, that you may come to know the Creator and learn of Him by His creations. He is not pleased with the blood and scent of a sacrifice of irrational creatures, but rather in the pure souls and hearts of men." Upon hearing this, the emperor ordered his men to take stones and shatter Zeno's mouth and cheeks. So violent was the strike, that his teeth were broken and cheeks crushed. From his wounds he bled profusely, but before he expired, he was taken outside the city and was beheaded, thus receiving the crown of martyrdom.